This week, it's Make It Girly. And I don't think you can get much girlier than this card! This card measures 5 x 6-1/2". I found that cute background paper in a barely-used K&Company paper pad called Berry Sweet. The princess is cut at 5" from Birthday Cakes cartridge and I added the doily trim at the bottom of her dress, along with her crown, which are both made with edge punches. The sentiment is an All Around Stamp from My Creative Time. I gave her a PK face. Of course, I had to add glitter in all the right places, ribbon, pearls, and a heart gem. We hope you'll join in the challenge this week and link up your "Girly" project to Die Cuttin' Divas. Be sure to use a die-cut too. Aaaaw, your princess looks amazing! Love the sparkle you added to her dress! The papers are perfect and love the bow! 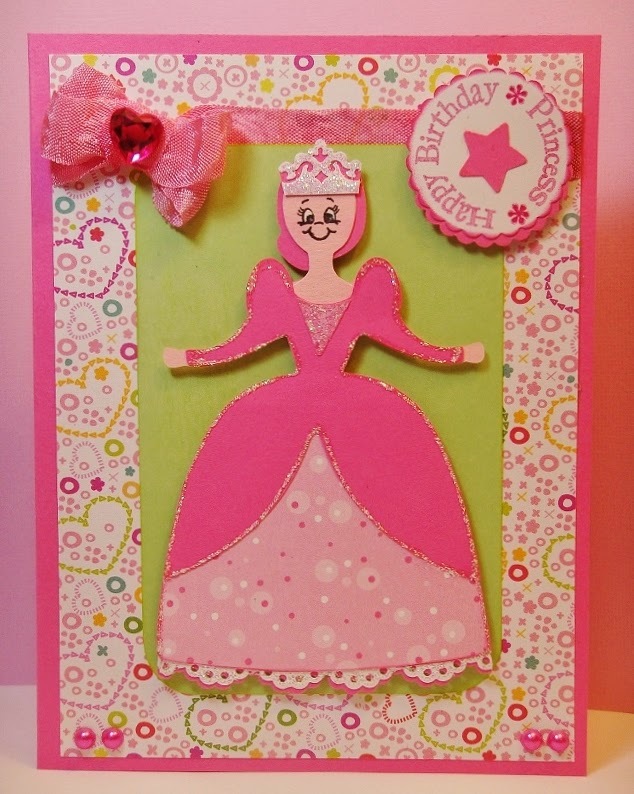 Pink, princess, gems, ribbon...yes...definitely girly! Love it! What a adorable card!!! Have a great day. Very cute! Ty for sharing!!! Oh how precious! What little princess wouldn't love it :) I think the patterned paper is so fabulous and I love the glitter outline you created on her dress too.